Loving Heart’s Sports, Tuition and Mentoring Programme (S.T.A.M.P) was launched on 13th February 2006 to target underprivileged children and youth within Jurong GRC in Primary & Secondary Schools. To impart values like integrity and empathy, through games, videos, and other engaging activities, to youth at risk. Mentors will be assigned to the participating primary or secondary schools within Jurong. Currently there are 4 S.T.A.M.P schools. · To serve as a positive role model for the student mentees. · To help build self-esteem and motivation in the mentees, and to assist them with setting goals to achieve academic and personal success. · Preferably be at least 18 years and above. · Ability to communicate with youth/kids openly and without judgment. · Willing listener, encouraging and supportive. · Interest in needs and concerns of persons with internal and external barriers to achieve success. · Available to mentor on weekdays, after school hours. · Able to commit for at least 6 months for mentoring. 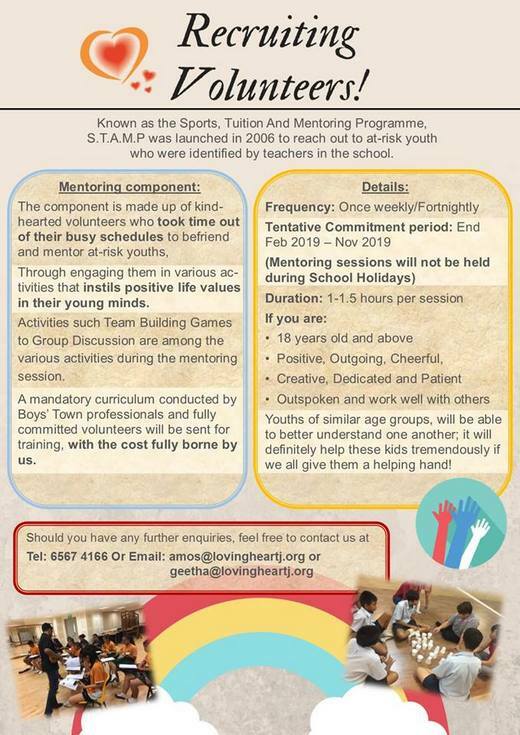 · Programme Duration: 10- 20 sessions of mentoring per school, per year. Training on understanding youth and conducting sessions will be provided upon clearing selection interview. Sessions are ongoing every week. Please email geetha@lovingheartj.org / amos@lovingheartj.org or call 6567 4166, if you are interested to be a part of this project.